I normally don’t include book reviews on the main page of Bleeding Espresso, but because I loved this book so much and because it does an amazing job of communicating principles such as mindfulness and living an authentic life, I just had to share it here as well. The Dalai Lama’s Cat is written from the perspective of a (self-described) gorgeous Himalayan who was rescued by the Dalai Lama’s staff and who spends copious amounts of time around His Holiness and those closest to him. 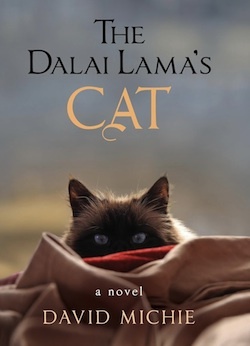 Click to read the rest of my review of The Dalai Lama’s Cat by David Michie, which I consider to be an absolute must-read of 2012. My heartfelt thanks for your very generous review of The Dalai Lama’s Cat! I am so glad that you enjoyed the book and also very grateful that you took the time and care to craft such a beautiful and coherent review. You are living the life that many urbanised Westerners fantasize about … perhaps a book from you some day? Hi David, thanks so much for coming by 🙂 I hope you saw the fuller version of the review (which I’ve also posted on Amazon and goodreads) — I simply cannot stop singing the praises of The Dalai Lama’s Cat! I’m actually working on a novel right now with inspiration taken from my daily life, of course. Thanks again for your comment; much appreciated! ha, sounds like a must read 🙂 thanks for the review! Woohoo! So glad you enjoyed it, AmyEmilia! While I, personally, don’t know much about Buddhism, I believe that all religions, spiritual belief systems, etc. (whether they’re Dharmic, Abrahamic, etc.) have valuable lessons they can teach us about life – regardless of the faith or ideology we adhere to – if we simply open our minds to the idea of allowing ourselves to learn from one another. Anyway, my sister and her girlfriend are interested in Eastern spirituality, so I’ll probably recommend this next time I talk to her – I have to remember to recommend your blog, too, because I think they’d really enjoy it! We’re still working on getting physical copies into bookstores both in the US and Italy, Chelsea, but hopefully you can get yourself a copy soon if you haven’t already! I look forward to checking out this book. I have a friend who is a painter, who met the Dalai Lama. It was a profound experience for him, to say the least. I’m loving your pics and your writings! Heya Michelle! Thanks for the book recommendation! I just began reading, The Dalai Lama’s Cat and it’s the cutest, smile-inducing book from the get-go. I’m so grateful that David Miche wrote this precious book and that you reviewed it via your blog. I definitely agree that the best way to achieve happiness is to give happiness to others… any way we can. “Greatness is not something we have, it’s something we give.” A Joyful New Year to you! Buon Anno! So happy you’re enjoying it, Dina! Oooohhh, thanks for writing this review! You inspired me to buy the book and I LOVED IT! I love cats and HHC is so endearing. I bought the ebook but I think I may seek out the hardcover for my collection because I will want to read this again and again. So happy to hear it, Leah! I so so loved this book…I think I’ll even plug it again on the BE Facebook page using your comment hee hee…..